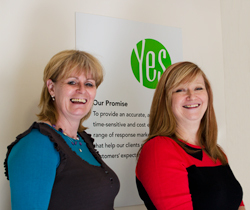 We’d like to say a big welcome to our two new members of staff here at Yes Response – Ginny and Emma. Ginny (pictured on the left) has joined us as a telemarketing administrator and will be undertaking follow-up outbound calls for one of our client’s prospective business-to-business customers. This will include the verification of contact details and assessing each prospect’s level of interest in the products and their purchasing cycles. Emma joins the team as an Administrator and will be handling and processing telephone orders on behalf of our clients, completing the daily postal and courier documentation for the high volume of items we despatch and inputting data for customer satisfaction programmes. A large mailing for local attraction Trentham Gardens to send out their latest What’s On leaflet, letting people know of all the latest events that will be taking place. A number of mailings for our housing association clients, including notices of rent increases, rent statement letters and rent cards. Database verification on behalf of a client to manually update their 28,000 customer records. The co-ordination and distribution of 8,000 DVDs to a network of 34 UK dealer locations and 19 worldwide dealer locations. The quarterly statement mailing for a regional credit union, going to 6,000 customers. Yes Response would like to congratulate our client, The Trentham Estate, on being selected as a finalist in the Large Visitor Attraction category in the biggest tourism awards scheme in the country – the VisitEngland Awards for Excellence. This is a great achievement, especially given the high number of applications for this year’s Awards, and we wish them luck at the final in May. Our client Move it or Lose it provides a range of exercise DVDs that have been specifically designed for older or less mobile people who want to continue to stay fit and active at home. Yes Response facilitates the distribution of these exercise routine DVDs with orders received via phone, online orders or by mail order. The campaign has become incredibly successful recently, following some editorial coverage in a consumer magazine. This has seen telephone orders for the DVDs suddenly increase from approximately 200 to 300 per month to over 1,200 orders in a period of 2 weeks. With no prior warning of this sudden increase, Yes Response has responded immediately, scaling-up resource on this campaign to handle the additional telephone orders and continue to despatch all orders on the same day that they are received, exceeding the customers’ expectations.